Los Angeles-based Diagnostic Automation/Cortez Diagnostics, Inc. offers a Urine Reagent Strip (Urobilinogen-Blood-Ketone-Glucose-Protein-pH-Bilirubin-Nitrite-SG) Rapid Test for the semi-quantitative and qualitative detection of Urobilinogen, Blood, Ketone, Glucose, Protein, pH, Bilirubin, Nitrite, and Specific Gravity in urine.Â The Urine Reagent Strip for Urinalysis is for in-vitro diagnostic use only. The Urine Reagent Strip (Specific Gravity) Rapid Test is based on the apparent pKa change of certain pretreated polyelectrolytes in relation to the ionic concentration. The test permits determination of urine specific gravity between 1.000 and 1.030.Â The test correlates within 0.005 with values obtained with the reflective index method. 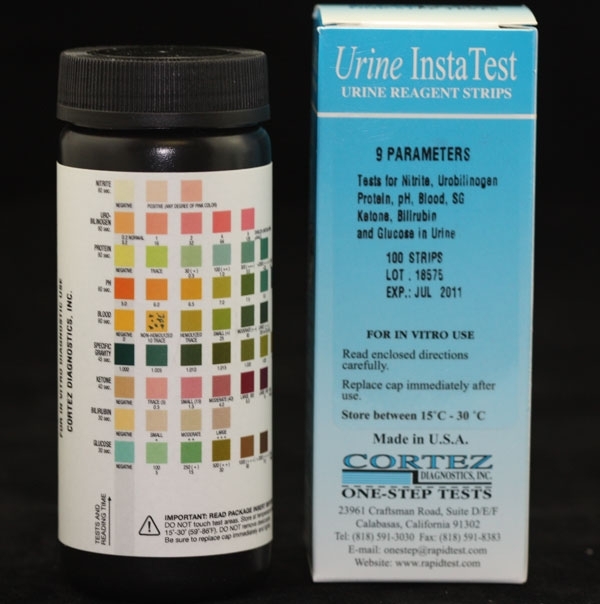 See Urine Reagent Strips for Urinalysis (Urobilinogen-Blood-Ketone-Glucose-Protein-pH-Bilirubin-Nitrite-SG) Product Insert for more specific details on preparation, procedures, storage, quality control, and interpretation of test results.